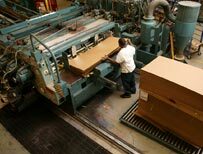 It is important to carefully consider all the factors that weaken the stacking strength of a box before products are packed and put into the distribution cycle. A target compression value can be determined by answering the questions on this worksheet. Remember the bottom box must support the top load over a period of time in which it may be exposed to fluctuations in temperature and humidity as well as other factors that impact performance such as excessive handling, pallet patterns, pallet deck-board spacing and box overhang. Enter the appropriate values from the table into the fields below. Enter 1.0 as the multiplier if the pallet pattern is columnar and aligned, if there is no box overhang on the pallet, if there is proper deck-board spacing on the pallet, if there is no excessive handling and if there is no head space in the box. A multiplier of 1.0 indicates that stacking strength is not weakened by this factor. The provided loss variables help determine a recommended safety factor. This safety factor is the mulitplied by the top load that the bottom box is supporting and a target compression value is calculated. Knowing the target compression strength will help your box designer determine the proper board to use for your box. *Load on Bottom Box: lbs.